“Christmas in July” is an annual food drive competition, between local Chambers of Commerce here in the East Valley and eastern Arizona, to see who can raise the most money and collect the most non-perishable food to help stock the shelves of United Food Bank during the month of July. Summer is the hardest time of the year for many individuals and families in Arizona. greater food-insecurity for entire families. The summer months are equally difficult for many low-income seniors who are often forced to choose between paying bills and purchasing food. You can participate in “Christmas in July” by making a Cash Contribution or by donating Non-Perishable Food Items during the month of July. Every $1.00 you give will help provide enough food for 4 meals to some our community’s most vulnerable members. Stop by the Mesa Chamber of Commerce at 40 N Center St, Mesa, AZ 85201 anytime 8am-5pm Monday through Friday and get a Food Drive box to place in your place of business. Congratulations to all the Chambers and the 144 Businesses involved in this years United Food Banks Christmas in July. An army of donors came together across the East Valley to raise more pounds and more money than ever for this annual event. As a group, we have provided 84,000 meals for the hungry in our communities. Special thanks to the Mesa Chamber members and staff for stepping up in a BIG way this year! Taking home the win for the Most Dollars Raised Per Chamber was Mesa with $7,243.20 and with the Most Pounds Colleted by a Chamber with 12,297 pounds! We love our giving members! And a very special shout out to our friends at Organ Stop Pizza for being recognized as the overall Chamber member raising $3509.20 in cash and 2114 pounds of food! 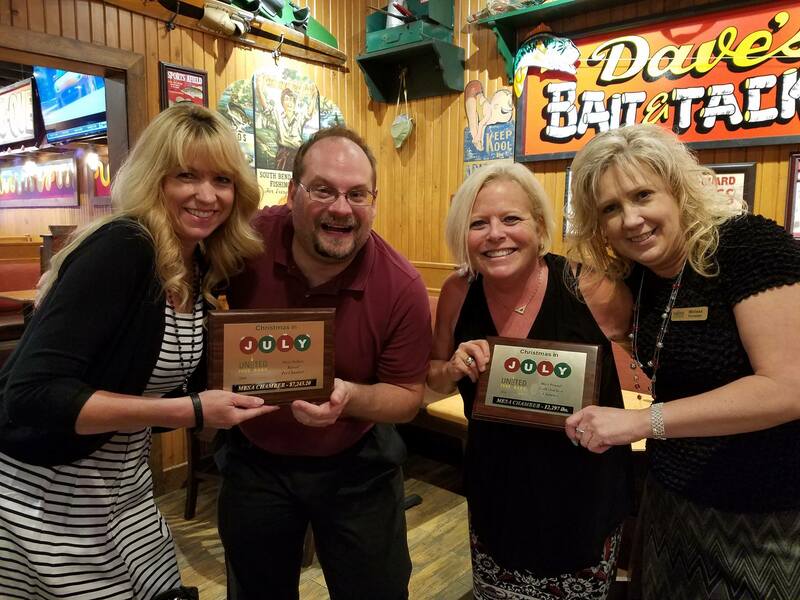 Way to go Jack and the team at Organ Stop! Christmas in July is officially over, but keep in mind, there are hungry people that need our help EVERY DAY! For more information, please e-mail Melissa Forrester with the United Food Bank at mforrester@unitedfoodbank.org / (480) 398-4464.